Includes over two hours of Fractal Animations and Cymatic Journey Videos! Additional video “Avatar Journey” balances all four elements of mind, body, spirit, and soul. This digital album offers mp3 versions of the binaural beat tracks used in the Four Elements visual journeys. They are designed to work in conjunction with Light Sound Machines, for full immersive brainwave entrainment. The companion eBook describes deeper mysteries about the alchemical process of Calcination as the first step of purification in the journey of awakening. The pure tones of sound and light reflect the astronomic movements of the planetary bodies as they orbit the sun. Complemented with thick harmonic layers, intuitive melodies, and evolving dynamic textures, each track is a subtle and gradual journey to deeper peace. These moving mandalas and cymatic imagery were programmed to match the same vibration of the soundscapes, entraining both auditory and visual cortex of the brain to synchornize with the celestial symphony of our universe. This fractal journey is an expression of the veils we must walk through to truly open the door to truth. Stimulates the third eye, and invokes the divine light of omniscience, the penetrating white hot light of truth. Let this ray of light slice through your emotional drama, your victim stories, and swiftly activate a state of lucidity amidst the turbulent waves of change. This fractal journey undergoes a series of illuminated transformations, as Entheo Music guides you deeper and deeper into a state of relaxation and trust. Relax into the Current of your Purpose and feed the inner fire, the light hidden within every cell of your being. 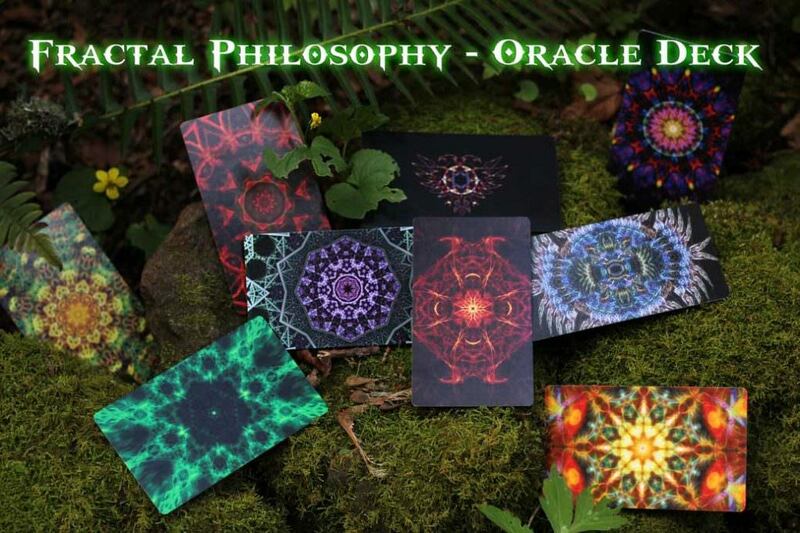 Aligning you from Cell to Self to Source, this 20 card Mandala Oracle Card deck is a journey through the 7 Chakras, the 7 Processes of Alchemy, and the Cyclical Nature of Life. Included in this package is a Digital Download Archive of all 20 mandala images in .jpg format, as well as a PDF GuideBook for your exploration of Fractal Philosophy. (Physical Cards Sold Separately) These portals are designed with the transmission of Vibration As Medicine. By meditating on these portals, or using them on your altar, you call in the vibratory pattern of that particular frequency to aid in spiritual transformation. These have been designed with the upmost care and intention, carrying the frequency of love and compassion as we enter into the phoenix fires of our own self-liberation. Included in this alchemical collection are three videos from our collaboration with OneDoorLand, Entheo Music, Elijah Ray, and Richard Rudd of the Gene Keys. These special videos include guided meditations and sonic soundscapes to liberate mind, body, and heart. Stream for free below or purchase this collection for these Bonus HD Downloads! Special Offer - $50 for EVERYTHING on this Page! You will be given access to download a large Archive Folder (.zip) that contains 3.3 GB of HD Media featuring over 140 minutes of videos, 62 minutes of audio, and two eBooks.